On one of out trips to the inner reef between two stunning islands not far from Matai we spot: a tiger cowrie, a banded sea snake, a black spotted puffer fish, a painted rock lobster, four trocus shells (alive), a snowflake moray eel, a giant moray eel, a turban shell, two conch shells (triton?) both alive, a cusion star and five vasua (one was 50cm long). During this snorkel trip we collected 60 crown-of-thorns star fish. I decided to design an new trip for the pearl farm. Suli appears to be really passionate and quite knowledgeable about reef life so could potentially be a great marine guide. Tom agrees to facilitate the proposal for a new snorkel trip to the pearl farm which includes some coral gardening and introduction to the reef for $40. 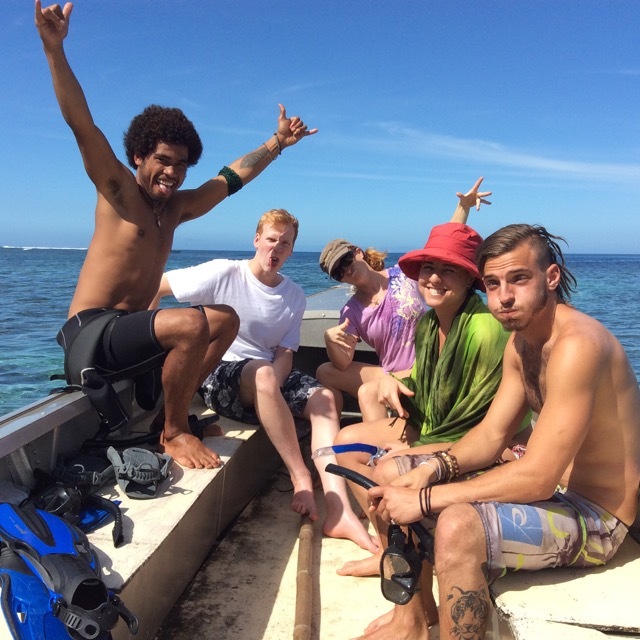 We snorkeled Vacala Bay to establish the state of the reef. It appears that much of it was flattened by Cyclone Evan (or still not growing back from Cyclone Tomas). There were however, pockets of reef that we can garden if we collect stag-horn coral from elsewhere. We collected 30 CoTs today. Taitai Taveuni (Agriculture specialists funded by Australian Aid) have initiated a local market in Matei. It’s designed to allow farmers, handicraft producers and small business owners to come to sell their produce. I went along to talk to the women about producing coconut jewellery for a friend who owns a company in the UK who want to supply these designs. We shared lots of stories under the vesi tree while sipping our coconut water. Real Fijian times, I love it. I’m interested in coconut jewellery for a potential buyer in the UK and on a personal level I like to buy fresh fruit and chat with the women, they are so eager to get stuff done!